38-37 on all cards. Bashilov down in the third. UBO middleweight title, 115-113, 118-111 and 117-111. Pilipenko was floored in the first and second. Angheluta was floored twice in the first. Mak down in the first. Khizanishvili weighed in reality in at around 74-75 kg. Gross mismatch and stopped early - which was good. Prodebut for Safar, a good talent. Prodebut for both. Skrijeli was down in the second and third and a point deducted for losing his mouthpiece a third time. Rossi worked very hard and Skrijeli couldn´t keep up but did allright. 40-36 on all cards. 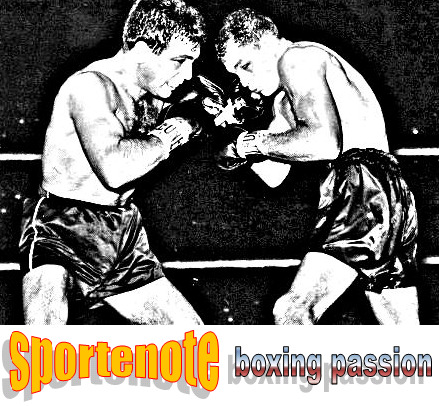 Gasviani looked like a green amateurboxer but was durable and knew how to survive. Skender was a wild slugger with no conditioning but Wadell got into a real brawl and took some punches. Skender retired early in the third, exhausted but not hurt. 40-36 on all cards, onesided but a decent fight and Kis was durable. Lauritsen broke a bone in the right hand. Lightheavy vs superwelter, no good and Dzinovic felt the same and sat after a few bodyshots and was counted out. The official weight is after dinner (!). Debut for Engström, the first ever professional fighter from Katrineholm. Prodebut for Cederros, mother of two, former soccer player, a big, strong but slow lady. Ostojic got off first but tired and was rescued in the final round. Laine won the vacant Finnish title on scores of 99-93, 96-95 and 97-95. Aduashvili was floored three times in the third. vacant IBF Int´l 126 lb title. 78-74 Kopytek, 76-76 and 77-76 Swierbinski. Jkitou won the vacant WBFed lightheavy title. 76-74 on all cards - I had it 76-76. Possiti was too experienced for Morell, who at first tried to use his size and reach, but was drawn into dangerous counters and was down in the first and third. The second knockdown looked bad but Morell got up and did better after that, punching and then smothering his opponent in ugly infights and that won rounds for him. Possiti was a same week sub for Beibi Berrocal and his permission to fight arrived at 5 PM on the day of the fight. It was an even fight for two rounds with Heinze scoring with harder punches while the volume came from the quickhanded Tavarez. It looked as if Heinze suffered a busted nose in the second. In the third Heinze was floored by a right, went down and now the nose looked very bad. What we didn´t see what that he also had suffered a badly cut lip and the doctor called it off and it was ruled a technical draw on the base that the lip had been injured by an accidental clash of heads. It was scored 28-28 twice and 29-27 Tavarez after three. 100-89 and 98-91 for Mock - and 95-94 for Edwards. I had it 96-93 Mock. Both began slowly and Edwards, with three Danes in his corner, looked a bit out of it. He was floored by a left hook in the second but got more into it in the middle rounds fighting of the ropes and scoring well on the inside while protecting himself in a slick way. But Mock´s workrate and conditioning was too much for him and he worked his way to another win. Tintor, a southpaw, did a number on Madsen, who was badly hurt in the second but grossly overweight as he was he tired badly and at the end of the third, where Madsen did better, he retired totally spent. Tintor came in on the week of the fight and it was the first time Madsen fought a southpaw - and it showed. 40-36 on all cards in a very - too fast - paced affair. Rossing came out fast and hurt Pavicevic with bodyshots and a right to the head - then another and the Serb went down and out with no count issued. Madsen worked Cebo over along the ropes and took him out with a left hook-right and another right to the body. Cebo sat the count out. Increasingly one-sided fight with Peric taking more and more punches before it was stopped. 60-53 twice and 60-54. Uzokov was floored early in the sixth. 40-33 twice and 40-34. Saltykov was floored in the second, third and fourth. 40-33 twice and 40-34. Margaryan was down twice in the first and once in the fourth. 40-34 on all cards. Ivanov was down twice in the second. Tikhonov was floored twice and then stopped. Semenov floored once and stopped. P floored and later stopped. Payazov floored at 0.34 and was later retired. 80-71 on all cards. Kisarawe was down in the last round. Pulatov floored and was retired.